When Checking for Structural Integrity, Prioritize the Container’s Overall Shape. When we inspect containers, we’re looking for structural integrity and cosmetic issues. 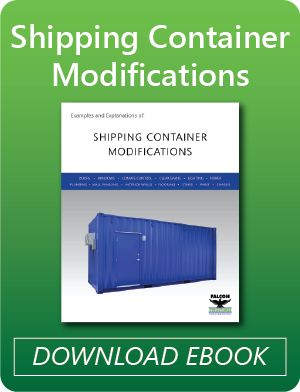 If you’re new to buying unmodified containers, it’s probably worth your time ­­to personally inspect the container. Structural issues are usually dents and distortions to key structural components, like the container’s frame. Start your inspection by examining the container’s overall shape. You want it to be as orthogonal, or in-square, as possible. If the container is noticeably slanted like a parallelogram, this could lead to problems when you try to modify the container. It’s important to look beyond the side walls. For instance, the locking bars on the cargo door, also known as the latching gear, don’t just keep the doors shut; they stabilize the box and prevent warping. You don’t need the latch gears to be in perfect condition, but if several bars are warped it could be cause for concern. The undercarriage is also important. If the cross members — the steel beams the support the container floor — are missing, the structural profile of the container changes. The most obvious sign of undercarriage problems is a heaved or uneven floor inside the container, so be sure to take a look inside. Try to Open the Cargo Doors and Inspect the Seal. Cargo doors are heavy, but an able-bodied adult shouldn’t have a problem opening them. To get a sense of what to expect, check out our video on opening shipping container cargo doors. If you struggle to open sticky cargo doors, it could a sign of a warped frame or rusty hinges. Either way, troublesome doors mean a lot of future hassle. Dents to the cargo doors and the surrounding area can also create gaps between the bottom of the door and the sill. Check for a proper seal on the door, otherwise pests and water may be able to enter the container. Dealing with Dents and Divots. Most containers will have a couple of dents. These smaller divots are generally ugly, but not a safety hazard. Again, look at what the dents do to the overall shape of the container. If the container is so dented that a side appears to be slouching over, examine the container for structural damage. Hammering out dents is doable, but time consuming. Dents in the roof pose more of a problem because of water pooling. Container roofs have a crown that can shed water, but divots where the metal is a bit thinner can fill with water, dirt and salt and eventually rust through. Look up when inspecting the interior to check for signs of roof denting. When to Worry About Rust. Rust is mostly a cosmetic concern. Containers are made of corten steel, which means small rust patches actually act as a protective patina that prevents further rusting. A bit of rust is to be expected on even one-trip containers, especially where there are scrapes. The container above has a normal to light amount of rust for used shipping container. Still, if your container needs to look tidy, consider how much work it will take to clean up the rust. You can read our blog on shipping container paint application and maintenance for guidance on repairing rust. Cancerous rust is a rare but serious problem. Unlike the usual exterior rust, cancerous rust eats deep into the steel and bubbles up underneath the paint. Extensive wart-like lumps under the paint are the most obvious sign. We won’t modify a container if we see cancerous rust because the container itself is likely defective. We don’t recommend you modify a container like this either. Dealing with Variances in Containers. 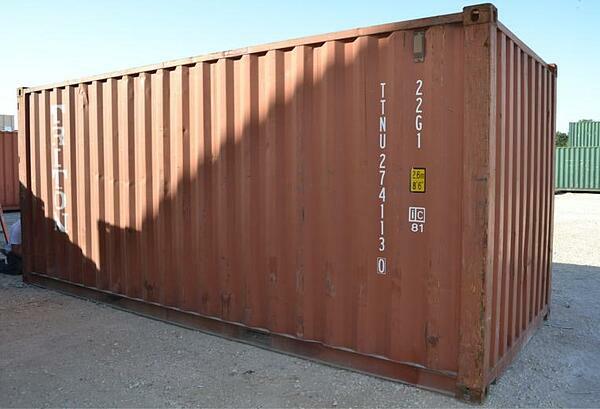 There are very clear ISO guidelines for what variances are allowed in shipping container dimensions. Maximum and minimum sizes are set, and there are standards for how orthogonal or how in-square a container is. In practice, containers vary a bit in dimensions, but they rarely go outside the tolerances. One-trip containers have different structural specs than used containers. After all, they’re not expected to survive 15 years of ocean traffic. They’re still within ISO guidelines and there shouldn’t be a problem for single container structures, but be sure to check the manufacturer’s specs if you plan on stacking the containers to create large multi-unit structures. Small variances also mean that containers placed side by side may not line up perfectly. The difference will probably not be larger than an inch, but it can still be a cosmetic concern. We recommend lining up containers at the midpoint to prevent noticeable overhangs. Nine Things to Consider Before Buying a Conex Container. How to Avoid Six Common Modular Construction Pitfalls. Is a One-trip Shipping Container New? A Field Guide to Different Types of Containers. Don’t want to worry about getting an ugly or unsafe container? We have a trained quality assurance team who can take care of that. Let Falcon Structures handle your container’s procurement and modifications. Contact us at 877-704-0177 or sales@falconstructures.com.